Posted by Ian Cole in Europe 2013, Eurovision to 50, Ian C, The Ians on Tour. Last night Ian and I celebrated the birthday with our friend Carl Magnus with dinner at Den Gyldene Freden (The Golden Peace). The restaurant was established in 1722 and is recognised as the oldest restaurant in the world to have the same surroundings, essentially looking the same as it did in the 18th century. 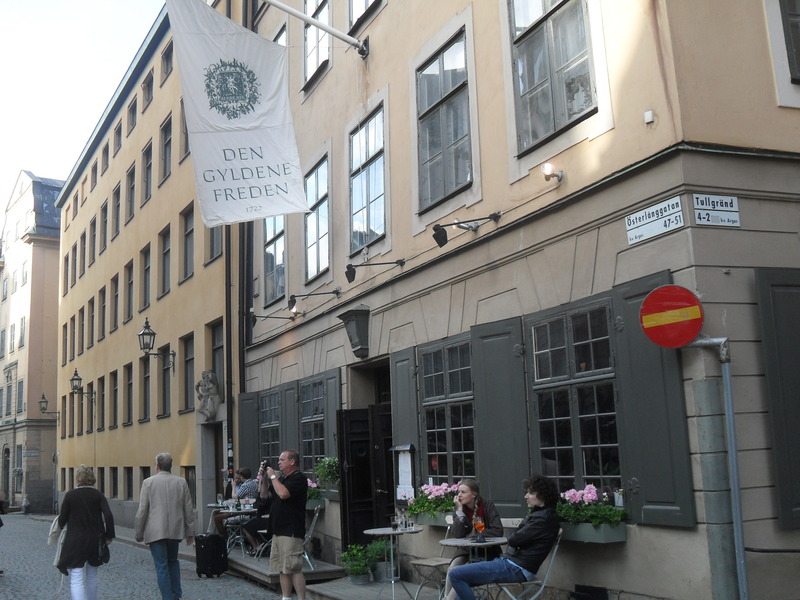 It got a reputation in the 20th century as a place frequented by creative types, and today the Swedish Academy (which nominates the winner of the Nobel Prize for literature) convenes there every Thursday. The restaurant extremely charming, and the food was delicious. We had a fun time, talking and laughing our way through the meal and a couple of bottles of wine. Carl Magnus also presented me with a very special birthday present. We may not have noticed the Swedish Academy, but midway through the meal Neil Tennant and Chris Lowe – the Pet Shop Boys – walked in (with what I assume was their manager) and sat down for dinner at a table close to ours. After we finished our dinner, and emboldened by the wine, Carl Magnus and I approached them. Carl Magnus told them he’d been a fan for many years, that he respected their work and just wanted to let them know. I then said that we were celebrating my 50th birthday, to which they replied wishing me a happy 50th birthday and joked that they were there as an arranged surprise for my birthday. So there you have it. The Pet Shop Boys have confirmed that I am now 50. Geez…….coming back home is going to be a big let down following all the VIP treatments of the past few weeks. We’ll ‘talk to your people’ but the best we will be able to offer is a few snags on the barbie, a couple of beers and You Tube clips!!! Wishing you a Bon European Voyage and safe trip back home!!! !